If you’re looking for rules in this book, stop right now. There are no rules. But there are well known and easily grasped principles that have produced highly readable fiction for the past several thousand years. The first is that a novel is best when it’s about one or more people. Even if it’s about an animal, it must be humanised to some extent – given thoughts, perceptions, ambitions, likes and dislikes … And that’s not because everyone loves an anthropomorph. It’s much more basic than that. It is because those are the qualities that make for successful fiction. The second principle is that there should be a conflict of some kind at the heart of it all … driving it forward. A novel giving the life-story of a blameless young woman who lives to be a hundred and is sweetness and light from first page to last would not generate much of a waiting list at the local library. But (you may now be thinking) your novel is nothing like that. Its 900-odd pages will be filled with brilliant existential insights into the human condition, amusing wordplay, amazing aperçus, and a 60,000-word vocabulary, so there is no real need for anything so trite, so banal as a genuine conflict. Right? Well, if that’s so, I’m afraid you are writing a literary novel – and this book cannot help you. So … in a genuine novel the conflict is central. It can be impersonal-and-external – an obsessive desire to climb an impossible mountain; a quest to find the Holy Grail. Or personal-and-external – the head of department is never going to promote me … my elder brother will live to a hundred and I’ll never inherit; the bureaucracy … church … army … mafia are slowly killing me. Or personal-and-internal: a woman may fight an injustice for 300 pages but then abandon the chance of victory because as well as nailing the culprit it might cause the ruin of a dozen blameless people; an innocent person may accept disgrace rather than see the family / regiment / school dishonoured. Spin a tale around anything resembling these conflicts and you’ll stand a good chance of sales. The third principle is that the solution to the conflict or dilemma cannot be a cop-out: “… and then he woke up. It had all been a dream!” Or: “Fortunately he won the lotto the very next week and the entire project was saved!” In the trade we call this a deus ex machina and we look down on it because it is Just Too Easy. However, to prove what I said about no absolute rules … John Gay gets away with it in The Beggar’s Opera when his popular hero Macheath is about to be hanged. Gay arranges for the notional author of the story to come on stage and rewrite the ending to reprieve Macheath and delight the audience. But Gay was a genius and I am not … and nor, most likely, are you. There are other principles but that’s enough for a start; we’ll meet the rest as we go along. Obviously, the reason for wanting conflict is to raise the tension and force us to read on to see how our hero/ine wins or, if you’re writing a polemical novel against injustice, loses (and makes you angry enough to Do Something about it). The easiest way to get any point across is to use actual examples. I could, for instance, take thirty-odd first chapters from novels down the ages – from Robinson Crusoe, say, to the latest literary sensation; but, even if you are now a teenager, you would probably be dead before I had acquired all the copyright permissions, negotiated the royalty share, and cleared my interpretations with the original authors – who, besides, would make a much better fist of explaining their own works. It is far better for me to dissect my own work. I can still more-or-less recall: what conflicts I wanted to dominate the story and drive it forward … what sort of characters I needed in order to make that conflict as sharp and meaningful as possible … and why I chose to start it with these or those precise words. I have been writing, publishing, and living off fiction since my first novel was published in 1962. The latest came out in 2008. In those forty-six years I had 59 books published by 10 international publishers (not counting translations). Thirty-one of them were historical novels set mainly in Victorian and Edwardian times with a few outliers in the 18th Century and the first half of the 20th. For most of them I had first to think of a central dilemma and then what sort of character (it was a woman in all but three of the stories) would have to cope with it. For the remaining few, his or her character came to me first and I had to devise a challenge that would provide the most exciting story without stretching the reader’s credulity. But in all cases those two elements – a character plus a dilemma – had to be present before I wrote or typed ‘Chapter One’ at the head of a blank page. “Eat your food,” she said. Like a good boy, he thought – except that he wasn’t a boy any longer. He remembered all the times his father had snatched food away from him, just as he was about to eat it … all the times he had gone to bed with the hunger gnawing at his guts. And for what? For some minor trespass against the old man’s notions of discipline. ‘We’re not like the others in this neighbourhood,’ he had always said. ‘We’re a cut above them all – and don’t you forget it.’ People said he killed his father – as good as. The way he’d behaved when he grew up and left home. He pushed his plate away. “I’m not hungry now,” he said. There’s no doubt that the showing version is livelier and – in between the lines – it conveys more subtle information. But it is longer and it keeps the reader hyper-alert in order not to miss any passing hint – as in “Not that again!” – and that kind of alertness can be taxing after a while. So you should forget any hard-and-fast “Show-not-tell” rule and pick whichever form seems appropriate to the story at that particular moment. Is it, say, a love scene and you want to hint at subtle differences in the lovers’ commitment? Then show it in subtle differences in their speech. Or is it a dull but necessary bit of back-story essential to the plot at that particular point? Then by all means tell it in as few words as may be necessary. in the 1900s a young Irish-Catholic child is accidentally left behind when the rest of her family emigrate and she is adopted by a rich Protestant woman; how can I weave all these separate strands into one climax where they all meet? … a stubborn father wants his nice but dreamy son to succeed him in business; but his daughter has other ideas – can she beat him at his own game? … and so on. I go on to show how the opening chapter dramatizes the problem and sets the story rolling toward its climax. And the ebook ends with a basic style guide for a novel, showing how to use ellipses (…), hyphens (-) and dashes (— –), commas, semicolons, colons, parentheses ( ), brackets [ ], italics, bold text, contractions (Mr, Dr, Rd, Ave, etc), and the perils of starting a sentence with an -ing word. 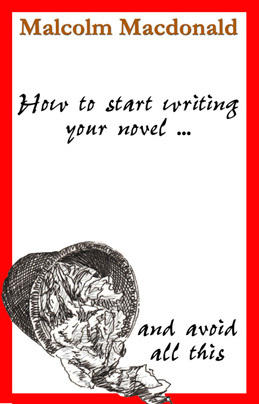 The advice is based on my professional experience as an editor, publisher, non-fiction writer, novelist, and mentor for 20 years of a county writing group, a dozen of whose members went from literary obscurity to published author.